JOHN WILKES BOOTH: One of the actors performing at Ford's Theater. He sneaked onto The President's Balcony during the performance, and shot Abraham Lincoln in the back of the head. Then he leaped down from the balcony sustaining a broken leg, but managed to escape out the front door. Days later, he was cornered by the authorities in a barn with an accomplice, David Herold. First, the police tried to smoke him out by setting fire to the barn, then they fatally shot him. LEWIS POWELL (AKA Lewis Payne): On the night Lincoln was assassinated, Powell was guided to the home of Secretary of State, William Seward, by David Herold. William Seward and is household were seriously wounded by Powell, but all of them survived. Though Powell managed to escape from the Seward Home after the failed assassination attempt, he was later apprehended and hanged. DAVID HEROLD: Aided Lewis Powell to The Seward Home so Powell could assassinate Lincoln's Secretary of State, William Seward; and shortly later, he aided John Wilkes Booth in his escape after he shot and killed Abraham Lincoln. He was later cornered in a burning barn with Booth, and he surrendered to the authorities, while Booth was shot and killed. GEORGE ATZERODT: He was assigned to assassinate Vice President, Andrew Johnson, but he chickened out. Later, at the Hotel Bar, he asked for the location of the Vice President which aroused suspicion, as it was the day after The Lincoln Assassination. The Police search Atzerodt's room, and found evidence linking him to John Wilkes Booth. Atzerodt was later arrested. 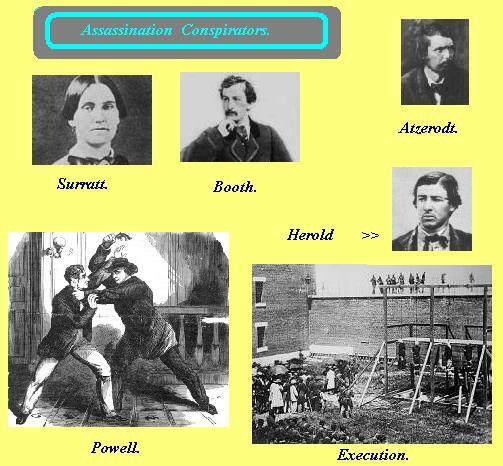 MARY SURRATT: She was the first woman in U.S. History to be executed by the U.S. Federal Government. Her Boarding House in Washington D.C provided the meeting location for John Wilkes Booth, Lewis Powell, and other conspirators who were plotting the Assassination of Abraham Lincoln and his Cabinet Members.